The dream of a Christian community living in poverty with a desire to spread the gospel to the villages around them. 20 families and 93 people have been worshiping in a neighbouring parishioners house lounge. Now on land next door, they have erected their first church which stands out as a beacon of hope and is where weekly services take place now. This ‘corrugated-iron church’ is the first step to fulfilling their dream of building the St Gabriel the Archangel Outreach Centre. A proposed two-story building on this site with the top story for the church and ground floor for community centre and church growth activities. The new Lay Minister only had a week to establish his new Church! And its still standing a year later, and the Parish grows in numbers and faith. The families are of Solomon Island descent. Their forefathers were kidnapped by the white people in the Solomons and Vanuatu, and sold as slaves to the white people in Fiji. This Slave trade activity was called ‘black birding’. These men who were tricked and kidnapped became alienated from their home and families, made to be slaves in a strange and harsh country. CMS missionaries befriended them and since that time the Church since the late 1800’s has been helping them to rebuild their lives. 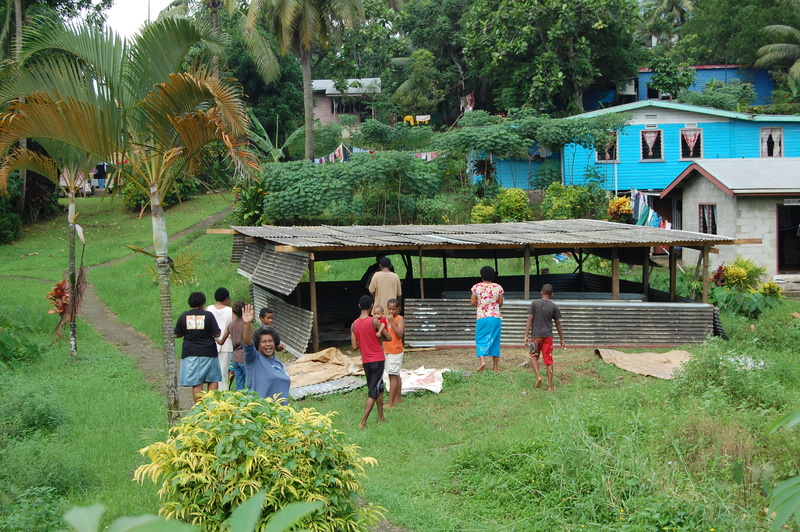 These Melanesian communities are regarded as the poorest of the races in Fiji. In this community only 13 have some employment and their incomes are below the poverty line of $8,000. Yet this Parish has already raised $18,000 towards fulfilling their dream of establishing their Outreach Centre.